Police will continue to oppose the relaxation of Scottish football's alcohol ban unless a nationwide public consultation proves its benefits. 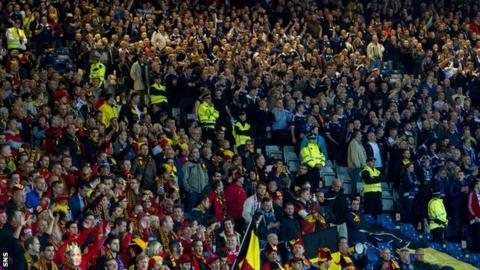 The Scottish FA has held informal talks with Police Scotland about relaxing the restrictions imposed in 1980. But Assistant Chief Constable Bernard Higgins said: "I made it very clear that, before we entered into formal discussions, a wide-ranging public consultation should be undertaken." He said this had yet to be carried out. "Police Scotland believes we should maintain the position of a no alcohol at football policy," Mr Higgins told BBC Scotland. "That said, in recognition that this decision was made following events in the 1980s, I have had some very informal discussions with the football authorities." Mr Higgins stressed that he wants a consultation to include the general public. "I was keen that this should be extended beyond the footballing community as any change to our policy would have a far reaching and wide social impact," he said. "To my knowledge, this has not been done as yet." "We encourage those involved in these discussions to consider all relevant factors in any decision made regarding a change to the current restriction on alcohol in Scottish football." A spokesman for the SFA stressed that fresh representations had been made to the police and the Scottish government, and that it was more than just about alcohol at football grounds, where it is still permitted for corporate hospitality. "Conversations have already been had with the government, Police Scotland and relevant supporters groups about improving the fan experience," he said. Sports promoter Barry Hearn had raised the matter on Wednesday, speaking at a think-tank convention the SFA hopes will become an annual event. The Englishman who has worked in boxing, darts and snooker suggested that selling alcohol was part of the "customer experience" and it was up to the authorities to police its use properly. Afterwards, SFA chief executive Stewart Regan told newspapers that the sale of alcohol at football grounds had been on the agenda of its Professional Game Board for several months. Restrictions were imposed after a riot that followed the 1980 Scottish Cup final between Celtic and Rangers. Scottish clubs have highlighted the experience in Australia, where low alcohol beers are sold but where spirits remain restricted. And the group representing Scottish football fans has called for a trial period for the reintroduction of alcohol in grounds. Supporters Direct Scotland say that in association with the SFA, their extensive research into supporters' perceptions of the alcohol ban, show that 62% of participants in the survey were in favour of lifting the ban, with 72% backing the introduction of a small-scale trial of selling alcohol in Scottish football stadiums. "We've got no plans to re-introduce alcohol into football stadiums at the present time." Andrew Jenkin, head of Supporters Direct Scotland said: "Although there was a majority in favour of lifting the ban, there are other aspects which should be considered before any decision should be taken regarding the ban on alcohol in Scottish football. "For example, consideration should be taken regarding the varying demographics of match-attending football fans. Our research revealed that the majority of female supporters were opposed to any relaxation of current legislation, as were respondents over the age of sixty." Michael Matheson, Cabinet Secretary for Justice in the Scottish Government, also gave no hints of a change of heart. "We've got no plans to re-introduce alcohol into football stadiums at the present time," he said. "This was an issue that was raised a couple of years ago by the SFA and by some of the senior football clubs in Scotland. "But we've got no plans to change that and, even if there was any consideration of looking at this matter, there would have to be a wide consultation with the police, other enforcement bodies, local authorities to consider what the implications were."